Heat oil in a saucepan over high heat. Add the speck and cook for 5 minutes. Add onion and cook for 2 minutes or until browned. Add the mustard powder, tomato paste and Worcestershire and cook for 2 minutes. Add the sugar, maple syrup, stock, tomato purée, salt and pepper and cook for 5–8 minutes or until slightly thickened. Add the beans and cook for a further 2–3 minutes or until heated through. Serve with the bread. Serves 4. + Speck is smoked pork usually sold in a slab from delicatessens. 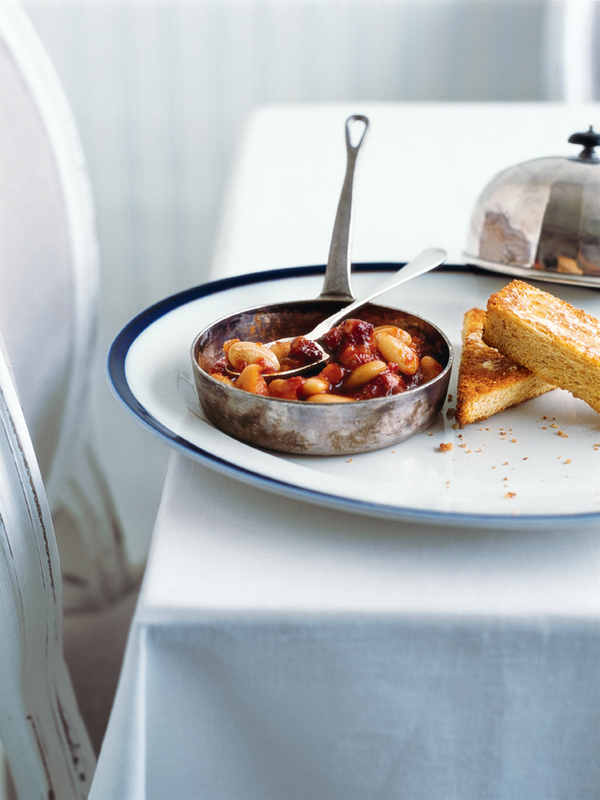 A lovely sweet baked bean meal that is a total hit with my partner & 7yo son. We bought a big cob loaf (whole) and tore pieces off to eat with it and mop up the sauce, re-creating a scene from a spaghetti western movie “They call me Trinity”. This recipe is a total keeper! Loved it!